Apple has finished filming Planet of the Apps, an unscripted series about apps and the talented developers who make them, according to a source who asked to remain anonymous due to the person's involvement with the show. Principal filming took place on an Apple-built set near Hollywood, the source said. Apple built the set and tore it down at the conclusion of filming. The set was absolutely beautiful and set up in a way like no other competition show I've seen before. It's very tech chic, with beautiful decor and decorations. Only Apple could do it this way. It's very, very well done. Steve Jobs would have been proud of the set. Planet of the Apps, produced by Ben Silverman, Howard Owens, and William Adams, better known as will.i.am, will have a competitive theme that draws some comparisons to reality TV shows such as Shark Tank and The Voice, the source said. It was a "very stressful" but "exhilarating" process, the person added. Apple posted an open casting call for the show in July 2016, looking for developers from San Francisco, Austin, New York, and Los Angeles to participate, and it began selecting developers around November. Over 100,000 apps applied to be on the show, and only 100 were selected for filming, a person familiar with the matter said. The developers selected to appear on the show met with and received direct mentorship from four influencers and entrepreneurs, namely Gary Vaynerchuk, Gwyneth Paltrow, Jessica Alba, and will.i.am. The influencers were "brilliant" and "provided a lot of value to the apps that they advised," a source said. The way that developers pitch is said to be "very unique," and "not as straightforward as just standing on a stage in front of the judges," a format popularized by shows like American Idol. In addition to influencers and judges, the series also has a "very famous" host, but the source does not want to play spoiler as to who it is. The developers who made it to the final round of the show will receive up to $10 million in funding and featured placement in the App Store at the end of the show's airing. The casting call described the series as both a "launchpad" and "accelerator" for iOS, macOS, tvOS, and watchOS apps and developers. Planet of the Apps will apparently be a "very inspirational show," particularly among the next generation of developers. During each app pitch, the show is said to have filmed the reactions of other developers live, which will likely result in some amusing footage interspersed throughout the season. Planet of the Apps website now says to "check back soon"
While filming has concluded, it remains unclear when the series will be released. WWDC 2017 in June is a definite possibility given it is a developer-focused conference. The series will likely be distributed through Apple Music along with Apple's other original content endeavors such as Carpool Karaoke and Vital Signs. Looking beyond Planet of the Apps, Apple is reportedly planning a much bigger push into original content this year to promote Apple Music. Planet of the Apps episodes, hosted by Beats 1 radio DJ Zane Lowe, will be released on a weekly basis through Apple Music starting in the Spring. Just kidding. This sounds so terrible Apple. How about focusing on real apps? The mail app is terribly basic. The calendar app is years behind. Still not a fan of the maps app and really the only thing you have going for you is the blue chat bubbles in iMessage . I cannot give an eyeroll large enough to be worthy of this nonsense. 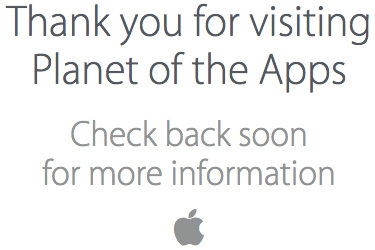 Maybe the least interesting Apple rumor in history. Yawn. Apple want to be a competitor to Netflix with this uninspiring garbage? Even iMessage is messy these days. Yup . I wanted to be positive. I just don't get why Apple keeps getting a pass from consumers these days. I mean will someone here tell me why after 10 years!!!!!!.... my videos are in my photos app? I wonder what these developers used to write their software: a 3 year old dual core mac mini with soldered ram, a 4 year old Mac Pro or a 3 year old iMac with a laptop processor, 5,400rpm HD and soldered ram ? Apple, how about building cutting edge computers instead of dabbling in leftist hollywood productions and politics ? They seriously need to revamp the reminders app. Let me guess ... Eddie Cue?